"MY NECK OF THE WOODS". 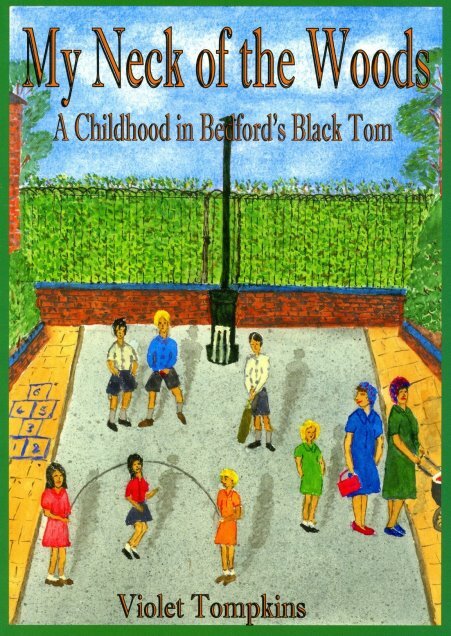 A CHILDHOOD IN BEDFORD'S BLACK TOM. The author of this book, Violet Tompkins, is better known to our members as Mrs. Groocock, who has talked to us on Lady Anne Clifford and Castle Ashby. She is, however, a Bedford girl born and brought up in the Black Tom (Prime Ministers) area of the town. In her childhood the area was a mass of small shops and trades people, which were able to serve its residents 'from cradle to grave' and she describes them in great detail. Her father was one of the two coal merchants in Garfield Street (the one with a horse). The other coal merchant who did the farther flung deliveries had a motor cart. Living nearby were the grandparents and aunts of Ronnie Barker, remembered by Violet as a nice old-fashioned family. She describes the games they played and the places she visited - the new Bedford School pool (which gave her verrucas) and the aviary in Bedford Park, as well as seaside holidays to Skegness. School for her was Clapham Road School and then the Harpur Central School where she learnt shorthand, bookkeeping and typing, leading to jobs at Meltis, Bennetts Clothing Factory and then at Unilever, where she met her husband. One of the most interesting parts of the book is her account of the implications of the war on her life. Her father, being a sole trader, was not called up, but served in the Home Guard. She remembers how he kept his sten gun (unloaded, fortunately) on her mother's dressing table so that he could get it quickly when needed. Her school was shared with evacuees from London - they used in the afternoons when Violet and her schoolfellows went on long walks. Then a Jewish family came to live in Stanley Street and would pay Violet to do jobs for them which they could not do on the Sabbath (such as turning the water taps off). She includes details of a visit to Holland in 1946, when the consequences of the wartime flooding of agricultural land affected her deeply, the Bedford floods of 1947, and a visit to the Festival of Britain in 1951. Her account finishes with her marriage in 1954, which is when she left her (fondly remembered) neck of the woods in Bedford for Northamptonshire. The book is enhanced by many black and white photographs - of the author, her friends and Bedford events. Altogether an interesting, informative and enlivening read.